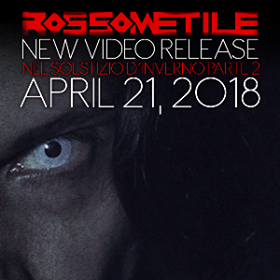 Rossometile, available the second part of the song "Nel Solstizio D'Inverno"
The new Rossometile single is finally available, entitled "Nel Solstizio D'Inverno Part 2". The song comes two months after the brilliant success of the first part, for a composition that re-launches the style and the state of one of the best Italian bands. "Nel Solstizio D'Inverno" is represented as a metaphor for the inner journey, a delirious journey that thanks to the magic power of a carillon allows the protagonist of the concept, to see himself from the inside, confront itself with evil and find the light in the darkness. The song was written arranged and produced by Rossometile, mixed and mastered by Jacob Hansen at the Hansen Studios in Denmark. The video is directed by Anna Manzo and Emilio Pantuliano with the editing of Anna Manzo. "Nel Solstizio D'InvernoPart 2" is available on all the best digital platforms. tagPlaceholderTag: news single, Rossometile, "Nel Solstizio D'Inverno Part 2"